Peace. Quiet. Comfort. You’ll find all three at The Bridge at Volente. Our location in North Austin, TX, near Cedar Park offers you the ideal blend of suburban charm and urban convenience. Close to schools, parks, and the friendly shores of Lake Travis, our community is perfect for those seeking an escape from the chaos of the city. From here you can walk to the local HEB to pick up groceries, or you can enjoy an early morning stroll at El Salido Park before heading off to work or school. With easy access to SH 45 and FM 620, getting to eBay, Paypal, Dell or Cedar Park Regional Medical Center has never been easier. Your spacious new apartment is even close to Lakeline Mall and the nearby Alamo Drafthouse. It’s your life. You choose how to live it. 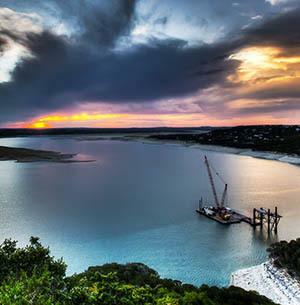 For those who love the lake life, The Bridge at Volente is only a short drive from Lake Travis and the Colorado River. Tom Hughes Park is especially popular with swimmers, while Windy Point is perfect for windsurfers. In the mood to do more than sunbathe? There are also two sand volleyball courts and several bike paths at Windy Point. Want to know more? Schedule your tour of The Bridge at Volente today. We’ll be happy to share our favorite restaurants, parks, and more with you on your visit.